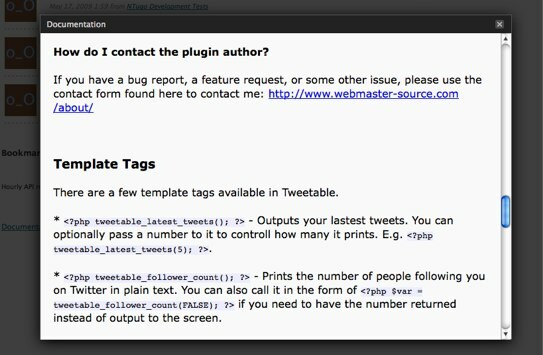 I’ve been working on a neat enhancement for my Tweetable WordPress plugin. Already I have a handy “Documentation” link on the plugin’s pages in the WordPress admin. When clicked, it opens a ThickBox dialog pointing to the README.txt file. Not bad, but it had a few rough edges. Raw markdown doesn’t look look stellar, and then there was the problem with the horizontal scrollbars that would appear from loading a plain text file into the ThickBox. So I made a new script that would load-up the README.txt file and use Regular Expressions to parse some of the more basic markdown syntax into good old HTML. As I write this, the changes haven’t been released to the public quite yet, as I have a few more things to finish up before putting out a new patch to the plugin, but they’re on their way. How do you pull off something like this? It’s not too hard. Now, between the two body tags, we’ll put the beginnings of our script. We need to reference wp-load.php, so we can access a few WordPress-related functions later. Now it’s time to load the README.txt file. Once we dump the contents into a variable, we run them through a series of functions. wp_specialchars() to escape PHP code and other unpleasant things, nl2br() to turn each newline character into a <br /> tag (which makes the text nice and readable, instead of a jumbled mess), and finally make_clickable() to turn any URLs into clickable links. With that out of the way, we move on to actually parsing some of the markdown formatting. Let’s start with turning backticks (`) into HTML <code> and </code> tags. It may look a bit…strange, but that line does just as advertised. The / characters signify the start and end of a Regular Expression, and the middle part isn’t too hard to guess at. The backticks are the markdown formatting we see wrapping a section of code (e.g. `echo $this;`) The part between the backticks, enclosed by the parenthesis, means “one or more of any sort of letter, number, or character.” The second argument of preg_replace() is the part we’ll be replacing the matches with, code tags with the content inside the backticks (represented as \\1) inside them. Now we do a similar thing for *italics* and **bold text**. It’s important to put the line for the boldface formatting before the one for the italics, otherwise you’ll have some Unexpected Results happening. Next we handle headings, which are marked-up as one to three equality signs on either side of a line of text. Once again, the order of the lines matters. That wasn’t too hard was it? It’s only the most basic markdown syntax that’s being parsed, but it’s lightyears better than plain text.